The Harlow recently conducted Art2018 — its 23rd annual juried art show — handing out awards to seven Maine artists. 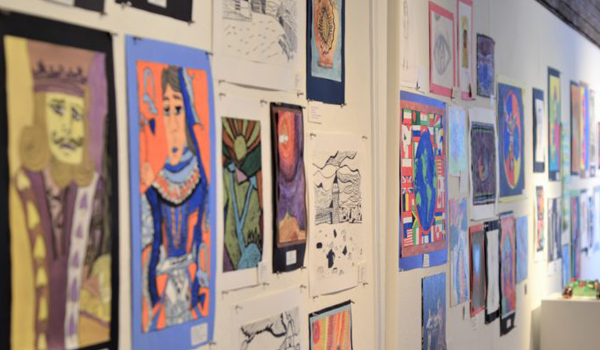 The show — a tradition that draws artists to Hallowell from all over the state — will remain on view through June 2 at the gallery. Prizes were awarded at an opening reception Wednesday, May 9. Second place, with a $250 cash prize sponsored by McKee Law was awarded to Patrick Stavens of Portland for his piece titled “Linked,” made with acrylic paint, molding paste and plastic on foam. Juror’s Choice Prize, and a $200 cash prize sponsored by the Stevens Commons was awarded to Julie K. Gray of Saco for her piece entitled “EVP Recording Equipment” made from papier-mache, acrylic, plastic, ribbon and yarn. “The energy expressed in the marks made by Matt, combined with the collaged elements lead to an exciting story, one that eludes and questions time and draws you in closer,” said Engstrom.  James Chute of Freeport for his piece “180120,” which is made with black gesso with traces of red acrylic on incised wood panel.  Andrew Elijah Edwards of Topsham for his untitled video installation.